PinkCloud.DK has come up with a design that could transform 400 oil refineries around the world into giant energy positive communities. 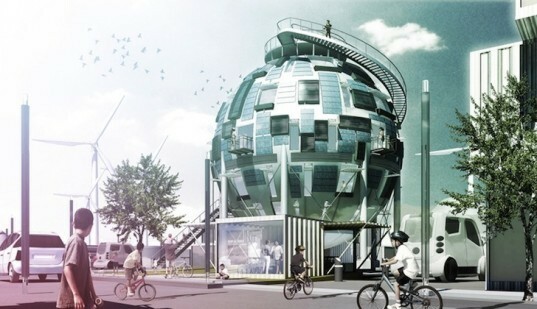 When the planet hits peak oil and there is no longer any use for the 49,000 silos that are used to store reserves, these spherical structures could make the perfect solar-powered homes. Their shape optimizes sunlight capture and they are also airtight, waterproof, and structurally bulletproof. An individual silo can be turned into a single family day-lit home, or whole refineries can be converted into interconnected communities that share resources. PinkCloud.DK’s recycled oil silos have everything we expect from a 21st century home, but first they have to be cleaned out. Detoxing the silos involves using in situ bioremediation – soil microbes that eat up harmful toxins. Once it is suitably cleaned, one or more families can move in. 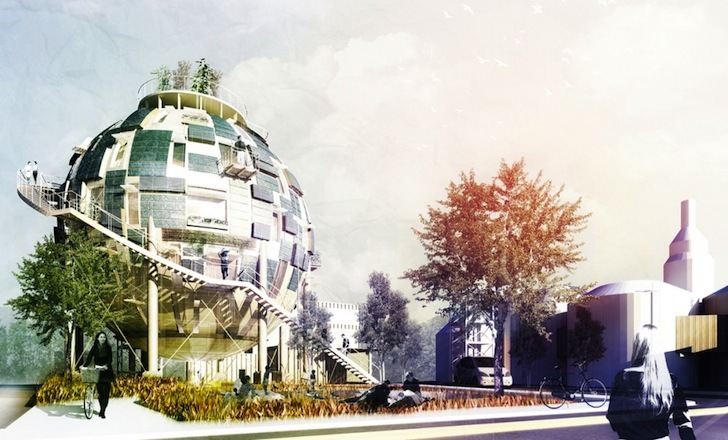 These 100% self-sustaining buildings have a green roof and green wall that absorb carbon dioxide and improve air quality, high-quality insulation, photovoltaic panels, a rainwater harvesting system and even a basement-level water storage area. The house is heated with radiant flooring, and water with solar power. Energy efficiency is achieved through passive design, and each level of the home is reached by way of a pneumatic elevator. It’s possible to connect up whole communities of these recycled silos that would share underground heating and all other infrastructure necessary to run an off-grid home on renewable sources of energy. When peak oil hits the planet there will be 49,000 abandoned oil silos and 400 defunct refineries in the world. PinkCloud.DK proposes to turn these into mega solar-powered communities. Each silo is solar-powered and heated with radiant flooring. A green roof and wall absorb CO2 emissions, rainwater is harvested and stored, and a pneumatic elevator connects each floor. This extraordinary design team is looking into the future and planning for it in a way that totally subverts the fossil era!